Celebrated novelist David Plante grew up in an isolated, French-speaking community in Providence, Rhode Island, where nuns preserved the beliefs of le grand Canada amidst the profound presence of their deep, dark God. Caught between his silent, part-Blackfoot father and his vivacious but trapped mother, Plante flees this small world, losing his belief in any god and finding the center of his life in love and in writing. Still, the ghosts of his past haunt Plante and drive him to embark on a stunning spiritual and physical journey. "[A] self-scouring undertaken with resolute frankness and considerable stylistic grace." 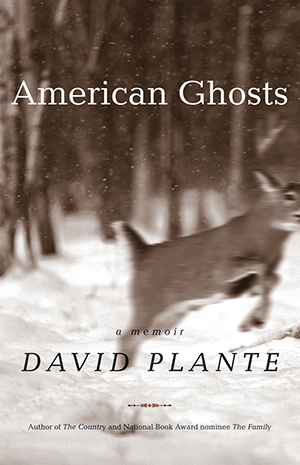 "[Plante] offers a strange, mysterious, and deeply hopeful sense of spiritual possibility." "Emotionally disturbing and spiritually exhilarating." "This wonderful book takes on what may be the hardest questions by allowing this most observant individual to see and hear in miraculous detail. How, it asks, does any person become American, let alone find a place in the breathing cathedral that is this majestic universe?" "As a heedful exploration of a psyche, a record of a vulnerable, likeable man's encounters with his memories, and a candid, unprotected disclosure of the wrestling between flesh and spirit, American Ghosts may be unsurpassed."